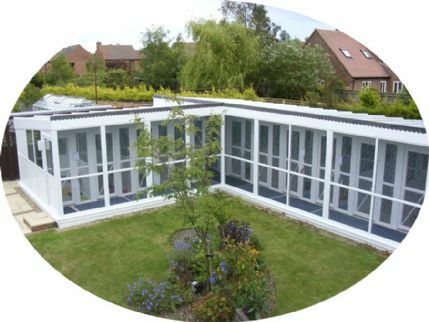 The Grove Cattery, opened in Oct 2009, offers professional care and attention in a secure rear garden setting. The proprietor is a graduate who has cared for cats for many years and regularly attends training courses to update and extend her skills and knowledge. e.g: feline related courses on renal dysfunction, first aid and diabetes. The Grove Cattery has 12 rooms each providing extremely spacious, quality uPVC conservatory style accommodation. Each room has a large fully insulated sleeping area with thermostatically controlled under-floor heating, "heatguard" roofing and automatic sensor controlled ventilation system. A single room measures 5.5m (L), 1.5m (W) and 2.1m to 2.5m (H) which exceeds ICC and CIEH recommendations. A room consists of a self contained bedroom with full length shelf and a separate play area. Contents includes bed/s, blanket/s, mats, chair, scratch post/s, litter tray and multi-sensory toy/s. Family rooms are available which can accommodate up to six guests from the same family. Each room has views of the garden's wildlife and water features providing an external source of interest and enjoyment. Playtime sessions take place at least twice a day to help develop bonding and relationships. The Grove Cattery has specialist pet health insurance which provides free veterinary treatment for all guests in their care. (subject to terms & conditions) The Grove Cattery is fully licenced by the Vale of White Horse District Council and is supported by local veterinary practices. The Grove Cattery gives professional 24 hour individual care and attention to every guest. Awarded an OUTSTANDING 5 star rating by VWHDC Inspectorate (2019). All cats must be vaccinated against Feline Respiratory Disease & Feline Infectious Enteritis. We care for cats with diabetes, asthma & administer prescribed medication as required. A collection and return service is available for an additional fee. Please enquire. Free text and email service, available on request. We have been letting our guinea pigs go to holiday camp with Marilyn and Chris for a number of years now and every time they come back safe and sound. Marilyn and Chris love all the animals they have under their care as though they were are own, with them always having clean spacious enclosures, with plenty of water, hay, food, love and attention. I have no hesitation in recommending them for your small animal holiday boarding needs. We've been leaving guinea pigs with Marilyn for a number of years. The provision for small pets is superb - indoor animals have a light and airy designated room - cages are always spotlessly clean, dietary requirements are met, nothing is too much trouble. I can't recommend Grove Cattery highly enough. We have boarded our beloved Burmese boy at The Grove Cattery since we first got him and wouldn't hesitate to recommend Marilyn and Chris' care and loving attention. He is always relaxed and happy, both when we drop him off and collect him. They go above and beyond what anyone could expect in order to ensure he is amused, entertained and loved. Bordering on Northamptonshire, Buckinghamshire, Berkshire, Wiltshire and Swindon. Turn left onto A338 at jn with A417(sp Oxford and Grove) bear right at Sainsbury rbt. Take 2nd exit at next rbt sp Grove. At traffic lights turn left into Grove village along Main Street. Passing shops on left and church on right. At mini rb turn left onto Denchworth Road (The Green) passing Bay Tree ph on left. The Grove Cattery can be found approx 300m on left.